Louis Valentino Park and Pier are named for a hero fireman who spent his early years in Red Hook and Carroll Gardens. Valentino gave his life while searching for three injured firefighters in a Flatlands garage fire on February 5, 1996. 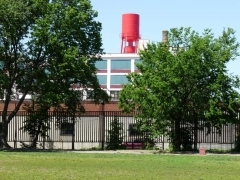 The park is surrounded by ancient warehouse and factory facilities, some of which have been repurposed for retail, such as the Fairway Supermarket. 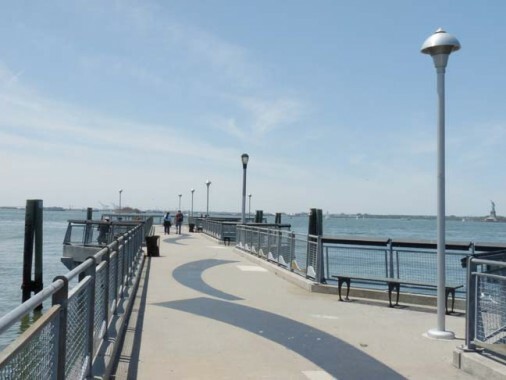 No disrespect intended to the fireman, but I’ve always wound up calling this the Coffey Street Pier, which opened in the mid-2000s. 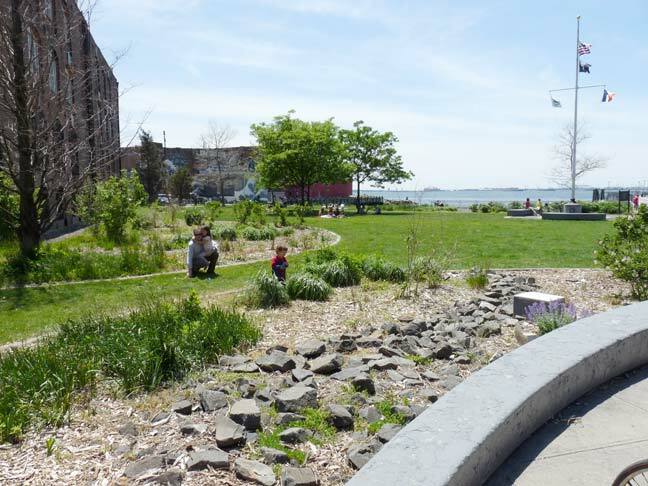 It matches the 69th Street Pier, a former ferry landing in Bay Ridge, for picturesque views and in some ways, surpasses it. Notice the World’s Fair style park lamp in the center. The DOT or Parks department usually follows the “use what we have lying around” rule when replacing lampposts. The Chesapeake Coast tug steers a barge past the Lady of the Harbor. 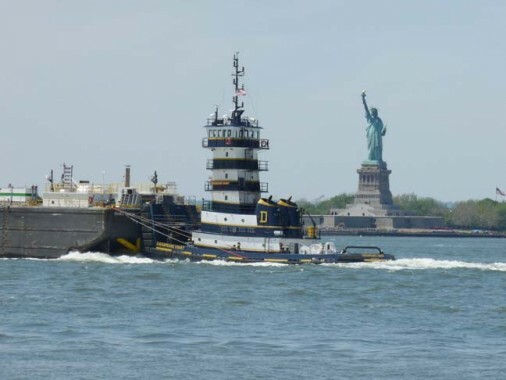 Though some tugboats working NY harbor are decades old, the Chesapeake Coast went into service in 2012. A pair of NYC icons. 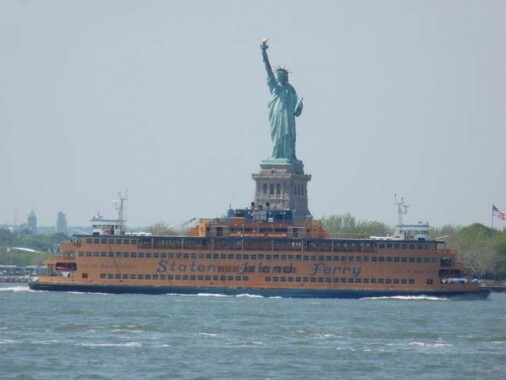 I didn’t see the front or back ends of the ferryboat, but it is one of the newest classes on the route, and it is probably either the John J. Marchi or Guy Molinari, named for recent prominent Staten Island politicians. 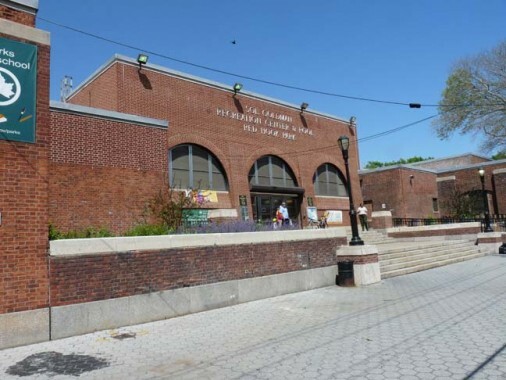 Molinari was a longtime borough president, while Marchi was a was a New York State Senator who represented Staten Island for a record 50 years. He lost on the Republican ticket to John Lindsay (I) in the 1969 mayoral race; he lost again in 1973 to Abraham Beame (D). 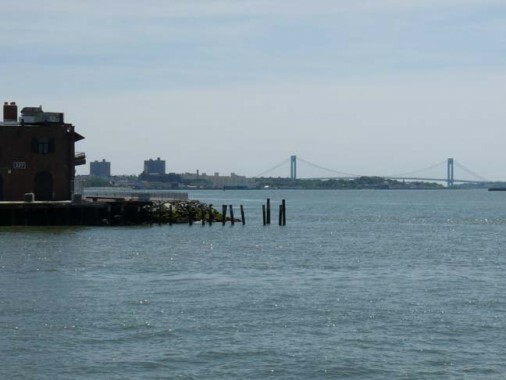 Looking south across Upper New York Bay toward Bay Ridge and the Verrazano-Narrows Bridge. A northeast view toward Lower Manhattan and #1 World Trade Center. 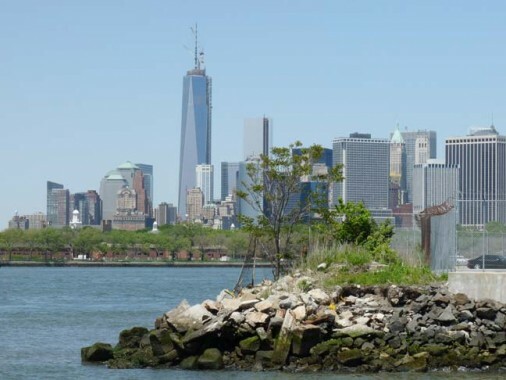 Governors Island is in the foreground. 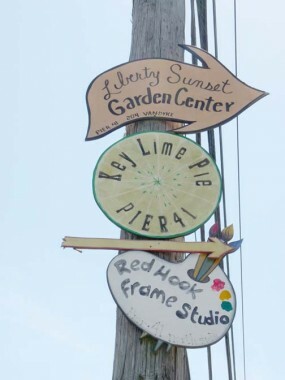 Pier 41 supports a number of retailers and wholesalers, such as the Flickinger Glass Works, Liberty Warehouse event space, Red Hook Winery, and my own favorite, Steve’s Authentic Key Lime Pies (I get the chocolate covered version on an ice cream stick, “The Swingle“) though I do wish they could sell water or juice to wash it down. 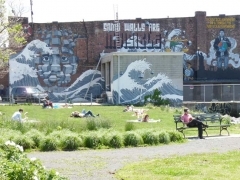 Just after my June 2013 visit, Steve’s relocated to a new location adjoining the Coffey Street Pier. Pier 41 (also known as Merchant Stores) was built by Col. Daniel Richards in 1873. 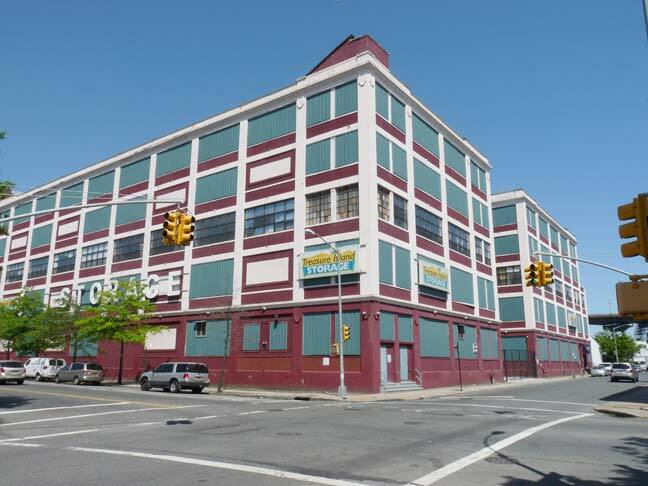 Richards is also credited with developing plans for both the Atlantic Docks (site of today’s Red Hook Container Terminal) and Erie Basin, the two waterfront improvements that brought about the emergence of Red Hook as a major shipping and warehousing center in the mid-19th century. Oddly, Pier 41 is attained via an unmapped Barnell Street. Close facsimiles of NYC street signs have been affixed to telephone poles, the difference being, they’re blank on one side and are likely not official. Two from Van Dyke Street. 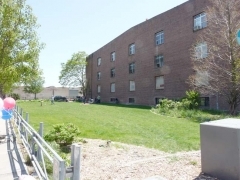 The first has an insanely long front lawn that is no longer used as a lawn. 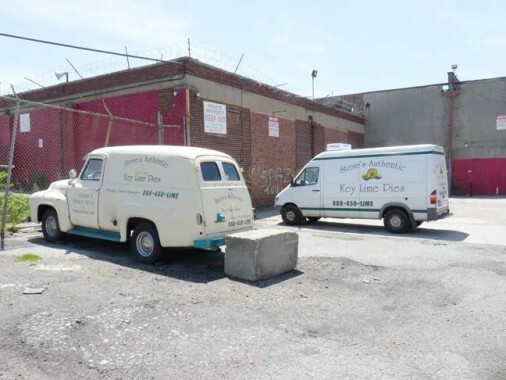 The second compares old and new Red Hook construction. 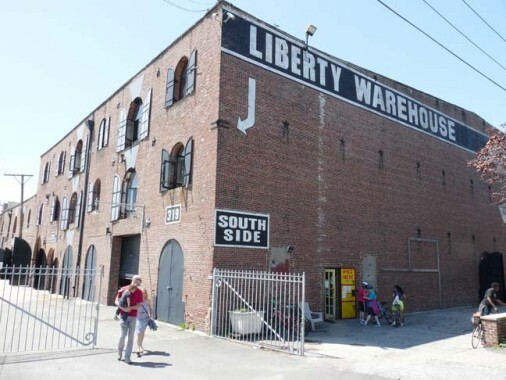 None of Red Hook is landmarked — there isn’t any one building historic or old enough to be so designated, and over the years, as in places like Greenpoint and Sunset Park, aluminum siding has found its way onto wood frame buildings. 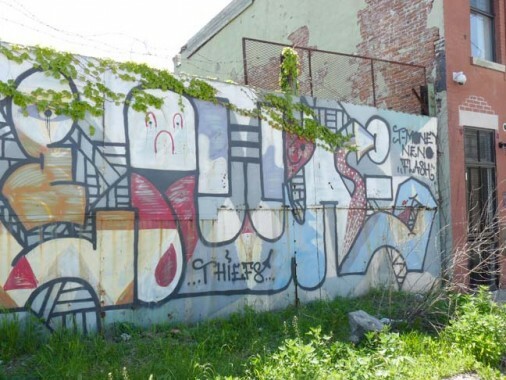 Local artists have created a number of signs pointing toward local highlights. 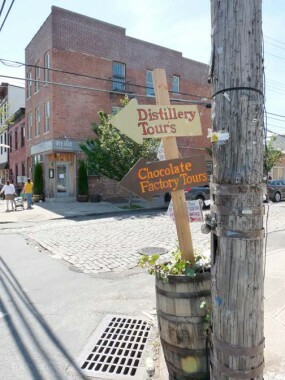 However, local pranksters have turned the signs in a barrel the wrong way and the signs were pointing in the wrong direction, away from the chocolate factory and distilery (see Part 1, linked above). 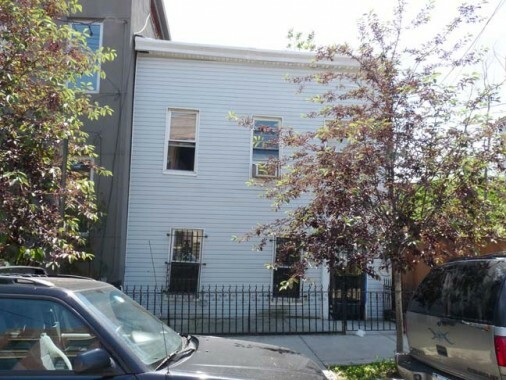 I’ve showed this house on Dikeman west of Richards before — I call it the Crooked House, since the windows aren’t lined up either horizontally or vertically. 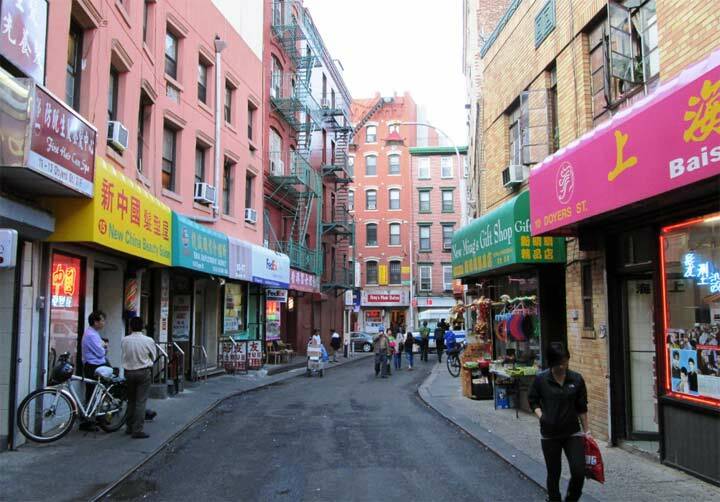 Walking east on Dikeman, a sampler of the housing stock. 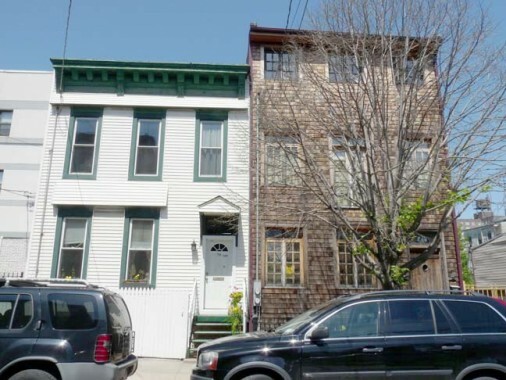 Some of these houses are quite old, late 19th Century kind of old, and only the modern siding belies their age. 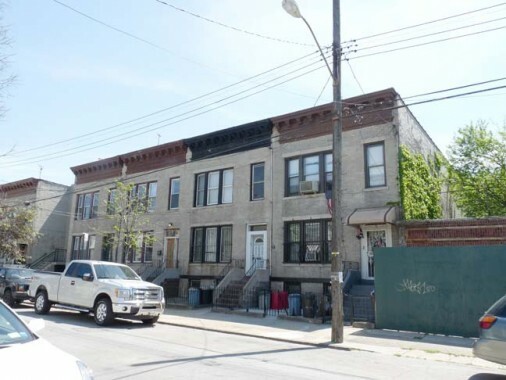 The second photo shows some attached apartments with stoops, something of a Red Hook rarity. 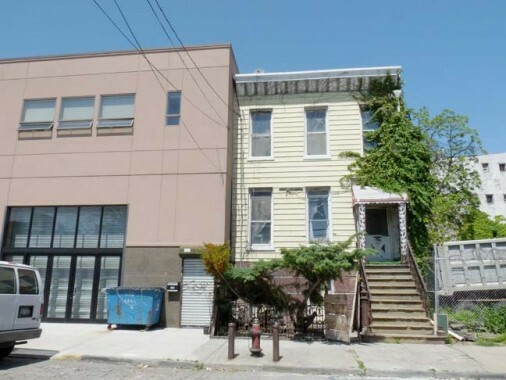 A handyman special at Dikeman and Dwight Streets. 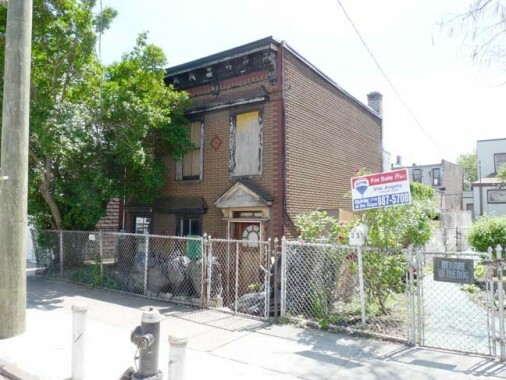 This one has surviving details that have vanished from other Red Hook houses, such as roof corbelling and the pediment over the entrance. 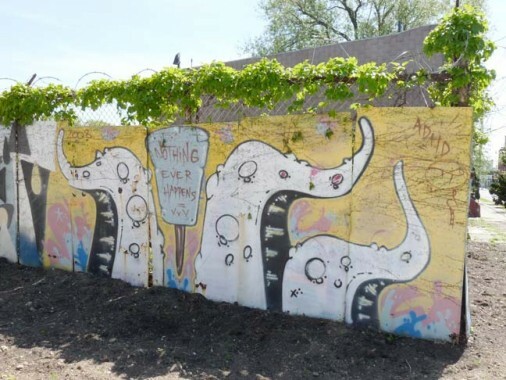 Some local art at Dikeman and Otsego Streets. Otsego is the only Native-American sounding street name in Red Hook. Perplexingly, Otsego County is in south central New York State and contains Cooperstown, where the Baseball Hall of Fame can be found. 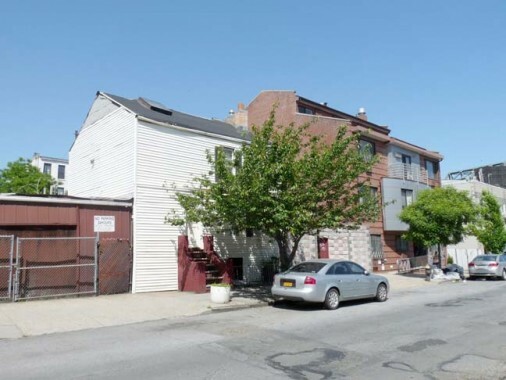 Red Hook has a nearly completely self-contained layout, and most of Red Hook’s streets do not leave the neighborhood with only a couple of exceptions like Van Brunt and Columbia. 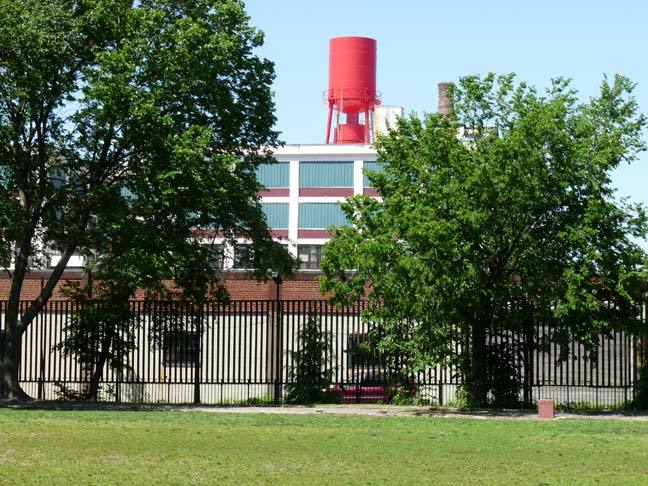 Walking south to Bay Street, past Red Hook Park and the Latin American food vendors who work from trucks now by law, and past the Red Hook Recreation Center, one of the eleven large public pools built by the Works Progress Administration at the behest of Parks’ Robert Moses. Lost City says it can be a pain gaining admittance. 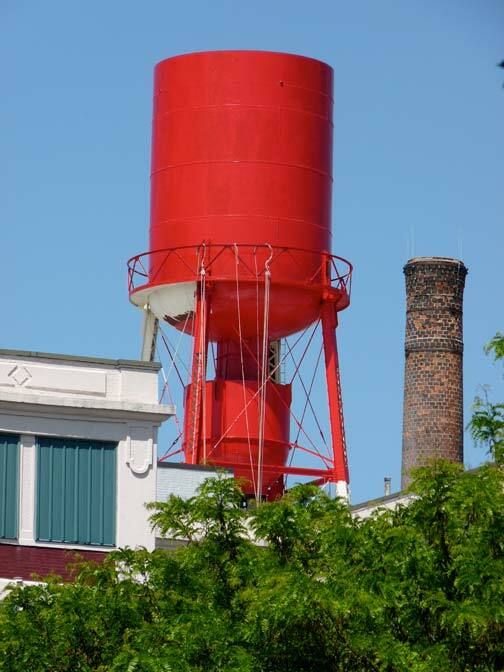 I’m not sure if this new Red Hook icon has a colloquial name agreed upon by the populace, but I call it the Red Tank (likely as water tank). 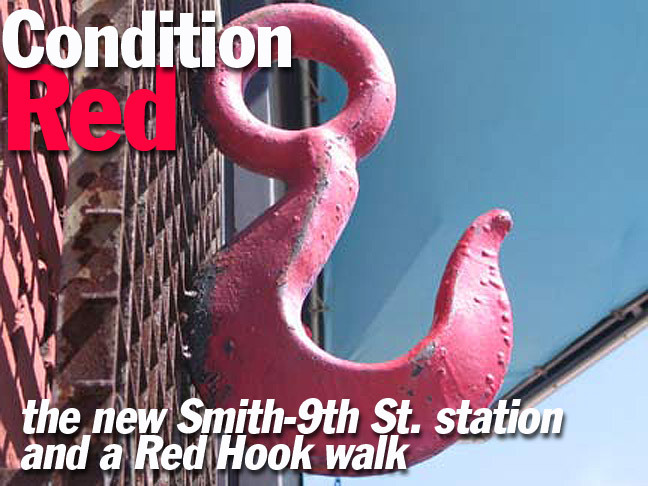 It’s visible all over Red Hook, most prominently from the Smith-9th Street station, which I will get back to shortly. It stands on the roof of Treasure Island Storage on Clinton and Lorraine Streets. 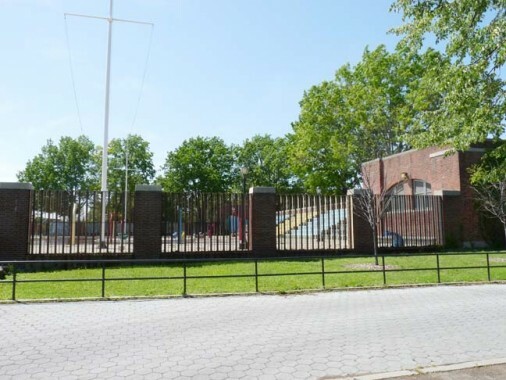 The Bush Clinton Playground, Clinton Street between Lorraine and Bush Streets. 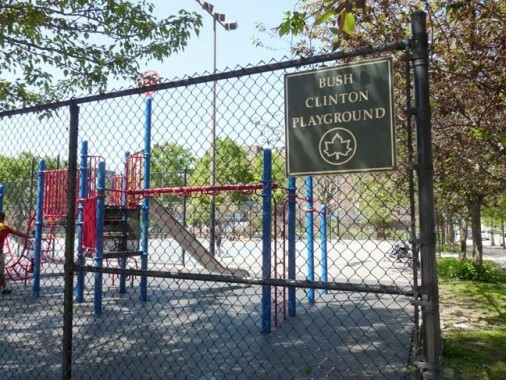 Likely another whimsically named Henry Stern-ism (the Parks commissioner under several mayors, including Giuliani) the playground is merely named for the cross streets Clinton and Bush, and not for “41, 42 and 43.” The Republican Presidents Bush and the Democratic Clinton have worked together on several projects, including rebuilding Haiti after the 2010 earthquake. Painted ad on Lorraine between Clinton and Court Streets. The UL stands for ULster. 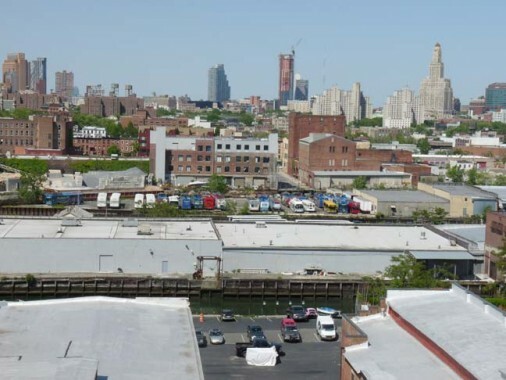 If you’re used to Court Street in Cobble Hill, Carroll Gardens and downtown, where it begins at Brooklyn municipal buildings and then runs past mostly mom and pop shops, it changes character completely south of the Gowanus Expressway — it’s all garages and factories, and used to be shipyards at the south end. 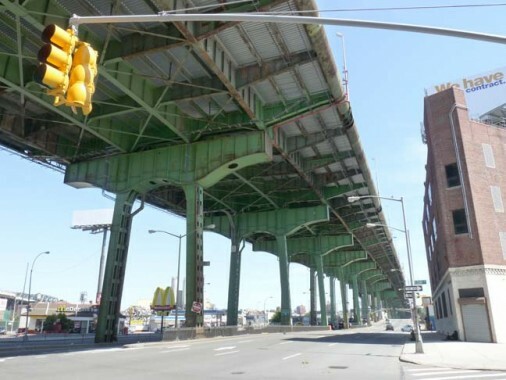 Here the Gowanus Expressway, which began construction in the 1940s but today connects the Verrazano-Narrows Bridge (1964) and the Brooklyn-Battery (Hugh L. Carey) Tunnel (1950) reaches its highest vertical point here, was it was built over 80 feet above the Gowanus Canal to allow tall-masted ships to use the canal without constructing a drawbridge. 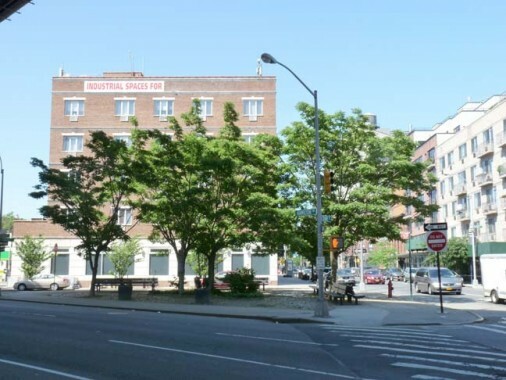 The clump of trees in a triangle formed by Hamilton Avenue, Court and Garnet Streets was given the name “Cough Triangle.” This ForgottenSlice explains why. Garnet Street between Court and Smith Street features a few buildings of very great age, including this nearly windowless salt box house. 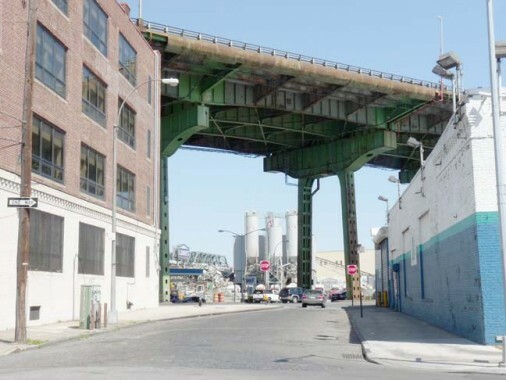 The IND subway viaduct makes an impressive sight as it crosses the Gowanus Canal, seen from Smith and Garnet Streets. 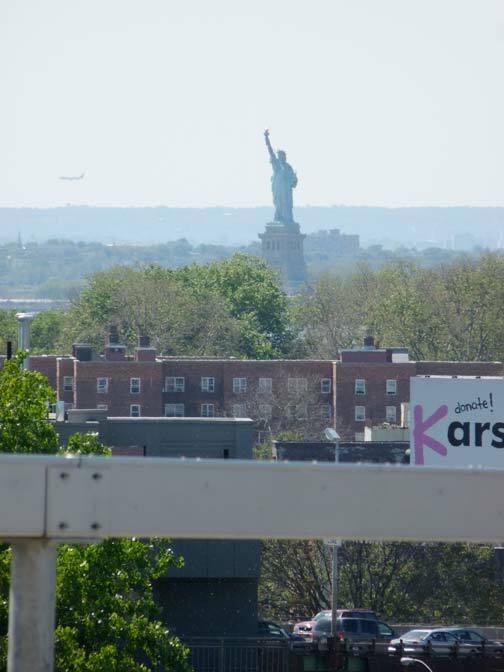 The Lady of Liberty can be seen from the north end of the Manhattan-bound platform, as well as Red Hook Houses and the large Kars 4 Kids billboard next to the Gowanus Expressway. The hills in the background are in northeastNew Jersey. 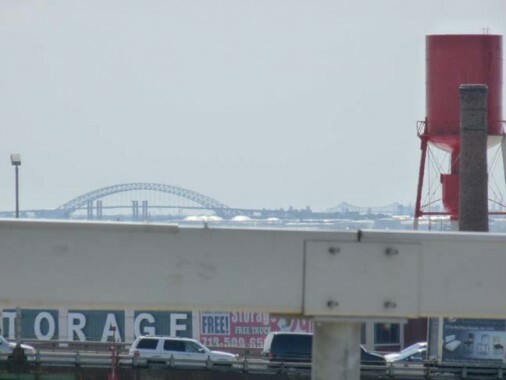 In addition to the Red Tank, the Bayonne Bridge (left) and Goethals Bridge are also visible from the 85-foot height. 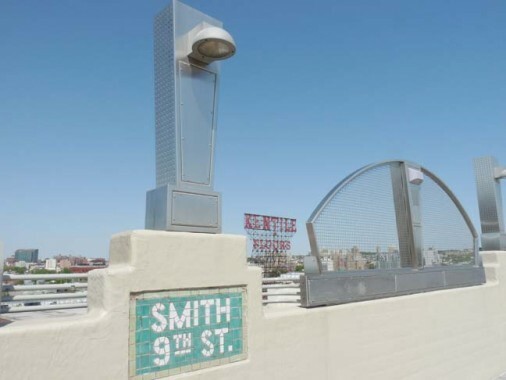 The newly restored canopied section of the Smith-9th platform. Squarish, mesh-wired windows have been added to provide views. 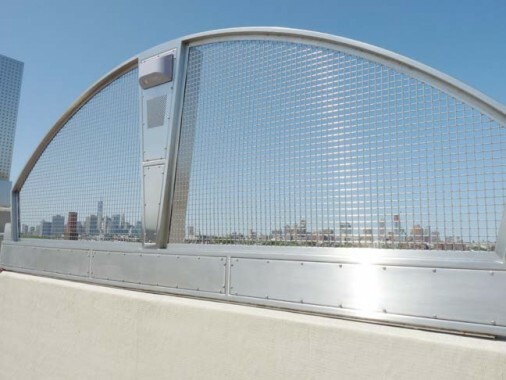 Though there are new lampposts on the platforms that are based on the designs of the former ones, they are metallic and feature high-intensity lights. On the pre-rehab platform, a cyclone fence protected passengers from falling or being blown off the platform. The same principle is still in use, but the MTA is using a design that to me resembles a tennis racket cut down the center. I believe the unit in the center is the public address system. You can get photos here but you have to stick the camera between the lamp and the edge of the screen. These had been the only traditional 1930s mosaic tiled IND signs that appeared on an elevated platform. I had been heartened to see that they survived the rehab. However, they didn’t. What you see here is a laminated photograph of one of the tiled signs, which was then applied with Super Glue or whatever to the platform wall. 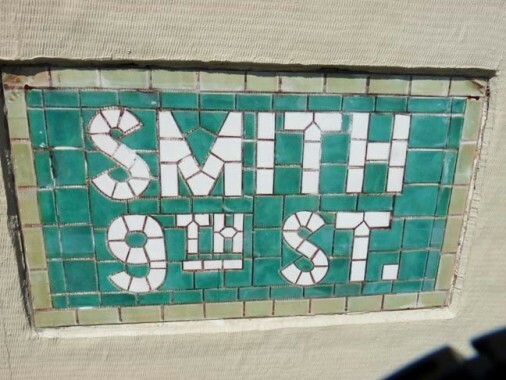 Purists are up in arms about this, and I don’t like it either, but the MTA says that retaining the mosaics in place during the renovation was impossible, so they did the next best thing. 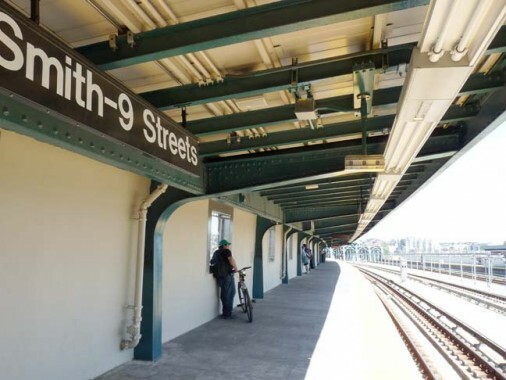 The MTA may decide to put new mosaics here, or stand pat with what they’ve got, though graffiti vandals could probably make quick work on top of these. 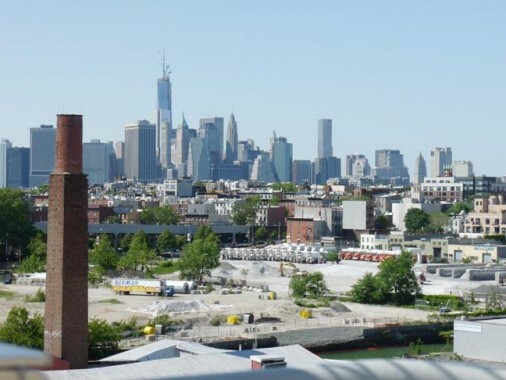 Highlights of the Brooklyn skyline, including competitors to #1 Hanson (Williamsburg Bank Tower, on the right). In the center is #80 DeKalb and to the right of that, #388 Bridge, both residential towers. 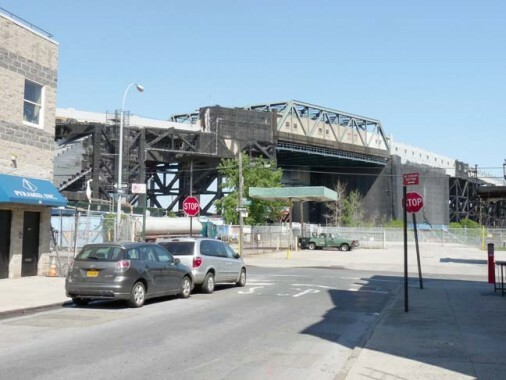 #388 Bridge will be Brooklyn’s tallest building when finished. 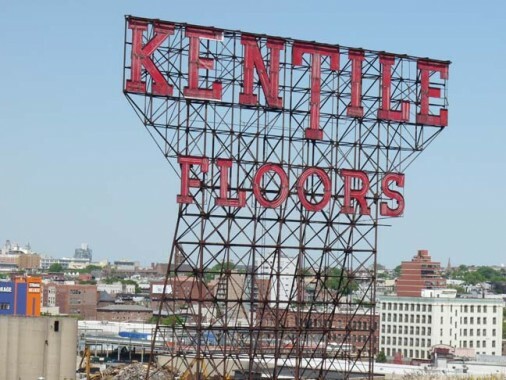 The south end of the Manhattan-bound platform affords the best view of the Kentile Floors sign, a FNY favorite. 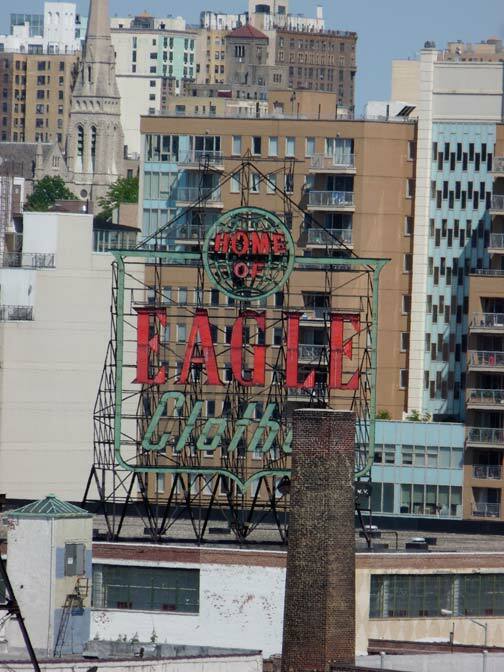 Also seen from the platform, with my zoom lens, was the massive Eagle Clothes sign, still at 3rd Avenue and 6th Street in Gowanus. And, the downtown Manhattan skyline, featuring #1 World Trade Center, NYC’s tallest, can be seen as well. 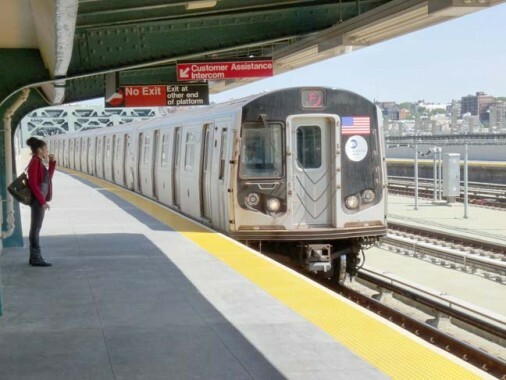 Actually, the D train fleet is made up of entirely R68s. The G uses R68s now, but formerly used R46s. The A only uses R32s in the summer. 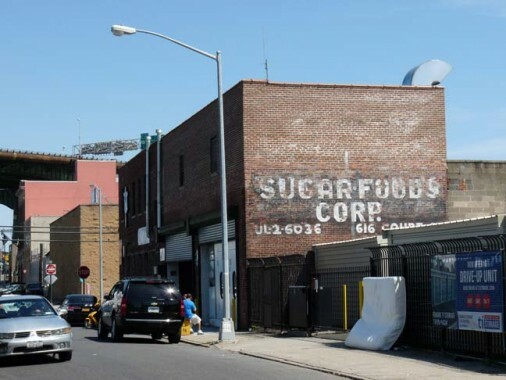 You mentioned the drawbridge over the Gowanus Canal– it was umpty years ago, but the St John’s basketball star, Lloyd “Sonny” Dove Jr, perished when a taxicab he was driving went off the bridge while it was in the open position. Dove had had a brief NBA career marred by injury, and had transitioned into broadcasting; he was one of the announcers for the Redmen (as they then were known; Dove, incidentally, was part Native) at the time of his demise– the Louis Carnesecca era of the 80’s, if I’m not mistaken. Sadly, as is true with many ex-NBA players, he had child support payments to make, and needed a moonlighting job to be able to cover all his expenses, as the broadcasting gig could not have paid all that much. A sad story all around. Which bridge was that? The 9th Street crossing or one of the others over the Canal? It may have been the Hamilton Av, now that I think about it. 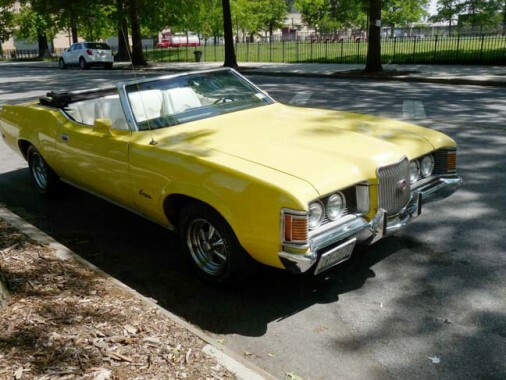 But the point was that he sadly perished in an accident that was as senseless as it was tragic. If I remember correctly he was supposed to have been driving too fast to have braked in time once he could have seen a flagman trying to wave him off. Obviously for this to have happened he had to have been the only car out there (having no reason to slow down if the bridge had been there and driving at what might be a reasonable speed on a deserted street in the middle of the night); or else, the flagman didn’t see him in enough time for any warning to do any good at any speed. Only two men really knew what happened, and only one was around later to tell the tale. Who knows? Sources doesn’t really say which bridge that Sonny died at. 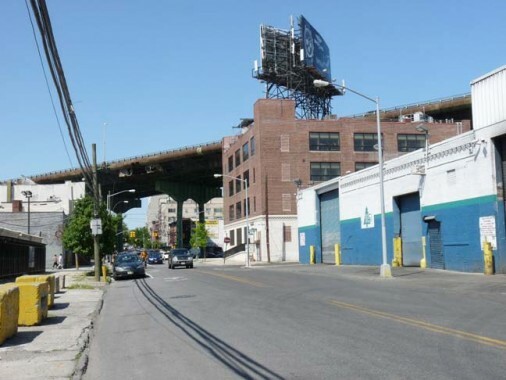 Fine write up, but you left me “hanging” – where does the Red Hook in the first photo hang? 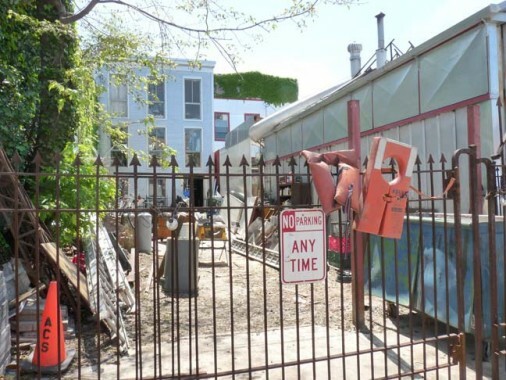 It used to be on Commerce Street — that picture is from a few years ago — but doesn’t seem to be on the latest google street view. What an awesome neighborhood. It has such an eclectic mix of so many different elements. 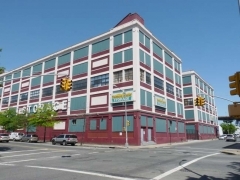 I know it’s starting to open up with the high-profile editions of Ikea and Fairway, but its physical isolation seems to be maintaining the flavor and distinction of the neighborhood. 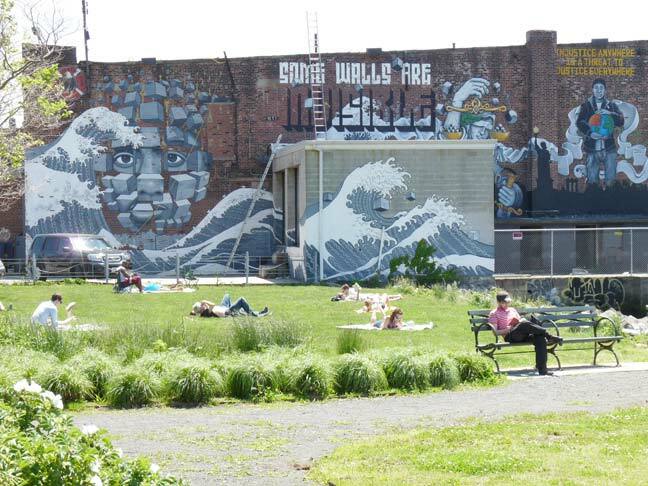 I think it’s a bit like Staten Island that way; little understood by outsiders and fiercely independent. I hope it stays that way. This was a great post. 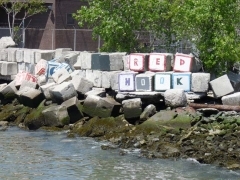 I really enjoyed learning about Red Hook. Still would have been better if they rebuilt the Twin Towers instead. Thanks, I learned a couple of new words. Regarding the house on Dikeman, I’ve seen those type of features on homes but never knew they had names: “roof carbelling” and “pediment”. I learned something today. There’s a stray vintage something on the j/z line as well from time to time, and sometimes there’s an f train that’s an r-46 or r-48 as well. My mother knew Louis Valentino from Brighton Beach in the summer when he’d work as a lifeguard. He was a cool,down to earth guy. I’ll never forget the day he died may he rest in peace.